Arundinella Raddi, Agrostogr. Bras. 36. 1823. Annuals or perennials; culms terete, hollow or solid, or hollow towards the base; ligule represented by a fringe of hairs or a ciliate rim. Blades linear to linear-lanceolate, with involute margins when dry, glabreus or with tubercle-based hairs. Inflorescence an open or contracted panicle. 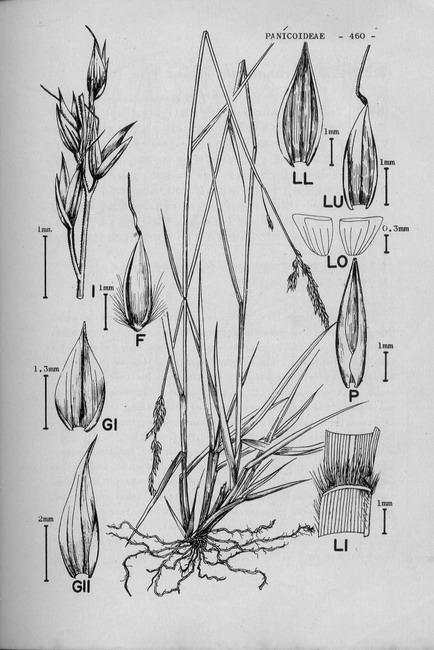 Spikelets equal, pediceled, solitary or in unequally pedicelled pairs, rarely in triads, 1-2-flowered; rachilla not produced, with a distinct internode between the glumes, articulate between lower lemma and upper lemma; glumes prominently 3-5-nerved, herbaceous; upper glumes longer than the rest of the spikelet, narrowed to sulcate in upper part; lower lemma herbaceous, 3-7-nerved; lower palea present; upper lemma smaller, chartaceous at maturity, rounded on dorsal side, scabrid, sometimes awnless, but usually with a terminal geniculate awn, and with or without 2 much shorter and thinner non-geniculate lateral awns; callus shortly bearded; upper palea thin, 2-nerved; stamens 0-3, the anthers oval, oblong or linear; styles 2, free or connate at base, the stigmas plumose. Caryopsis free between upper palea and lemma, the hilum punctiform. About 55 species distributed m the warmer regions of the world. Three species are found in Taiwan.